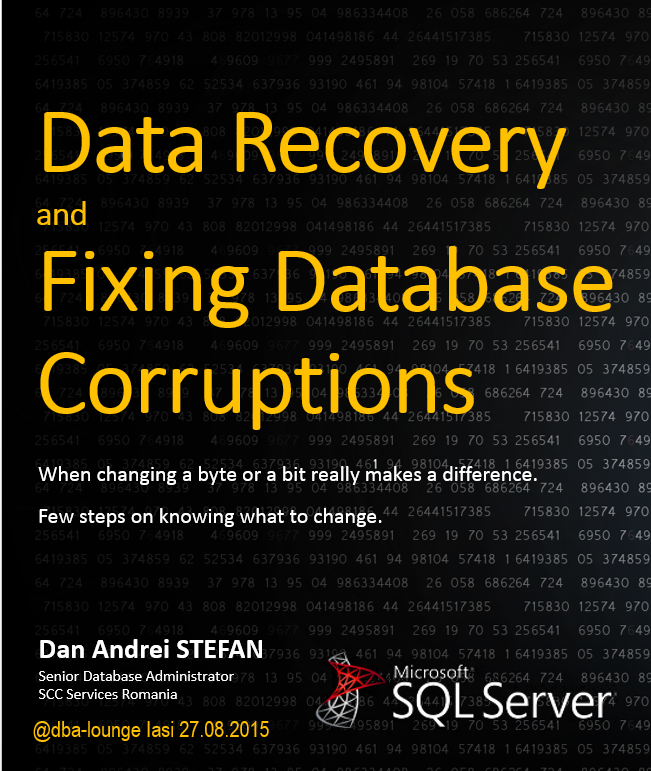 I had recently presented to local DBA and Developers community in Iasi (Romania), a session on database corruptions and data recovery techniques in SQL Server. It was interesting to discuss pros and cons of the approaches used in the demo, root causes for the corruptions, finding differences and correspondences Microsoft SQL Server vs. Oracle. 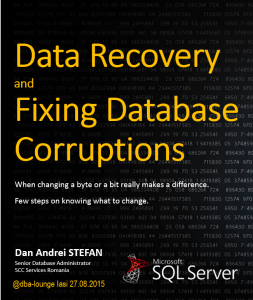 This was a touching base with Microsoft SQL Server storage internals and in the same time a “deep dive” into what can be done in order to protect/recover data. As part of the Database Corruption Challenge I needed to convert the LSN values returned by fn_dblog() / fn_dump_dblog() to numeric. The math is not very simple and it is best described by Paul Randal. Last week I came across an interesting DBA challenge. Steve Stedman launched a 10 weeks “Database Corruption Challenge“. The interesting part, so far, is that data can be recover 100%. To me, this is the actual challenge: how to be 100% sure that all data was recovered?! From recovering data using indexes, to fixing page headers using DBCC WRITEPAGE or Hex editors, this is an excellent opportunity to practice recovery skills. I will discuss about my solutions to each of the challenges, in future blog posts.